Family and the beautiful weather in Southern California won out for the time being. Now, skip ahead 45 days into a stalemate without an end in sight between the league and the Player’s Association and things have changed for the rugged power forward. MayorsManor can announce and confirm that Brown is heading overseas to play for the Zürcher Schlittschuh Club – more commonly referred to as ZSC Lions – in Zürich, Switzerland. The story has many sub-plots too, including Brown being re-united with former coach Marc Crawford – yes, the same guy the Kings fired in June 2008 after two years behind the bench in LA. Not that there’s much correlation between the two situations, but it’s at least interesting enough to note that Brown’s best offensive output for the Kings (33 goals, 60 points) came during Crawford’s final year in SoCal. Since the player and coach parted ways back then, Crawford went on to be fired by the Dallas Stars a few years later and was working as a TV analyst with TSN not that long ago. Brown, on the other hand, was named captain of the Kings later that same summer and this past June won his first Stanley Cup Championship. A native of Ithaca, New York, Brown has certainly played the bulk of his hockey on rinks in North America – including three years with his junior club, the Guelph Storm (OHL), prior to being selected by the Kings in the first round of the 2003 NHL Entry Draft. He also played for the Manchester Monarchs (AHL) during the 2004-05 NHL lockout. Yet, international action is nothing new for Brown. Just last fall, Brown and his Kings teammates opened the season in Germany and Sweden (something they all joked about with us here prior to leaving on the long trip). Additionally, of the seven times he’s played for USA Hockey, four have come outside North America. During his early years he participated in the 2002 IIHF World Junior Hockey Championship, known as the premier gathering of under-20 prospects. Held in the Czech Republic over the two weeks following Christmas 2001, Brown scored a game-winning goal and added three assists in the tournament, where he was the youngest member of the U.S. team. Two years later he returned to the Czech Republic for the 2004 IIHF World Championship and won a bronze medal. Brown has also joined USA Hockey for games in Sweden (2006 IIHF World Championship) and Switzerland (2009 IIHF World Championship). In 2006 he led the team with seven points (five goals, two assists) in seven games. So, wearing the red, white and blue in Europe is nothing new – only this time it will be with the ZSC Lions and not Team USA. By signing in Zurich though, Brown moves from one championship club to another. The Lions won the Swiss League title last season. More recently, they’re coming off their worst defeat of the season – a 5-1 road loss to HC Davos on Tuesday. It was their second loss in a row, after dropping a game Saturday 2-1 to HC Ambri-Piotta. Prior to that, the Lions had won six straight games. They currently sit in second place with 34 points after 19 games played, nine back of leader Genève. ZSC has a game tonight and one more this weekend before the league goes on break for the annual Euro Hockey Tournaments. So, Brown will leave LA next Wedenesday and debut with the Lions on Tuesday, November 13 vs. EV Zug wearing jersey #32. 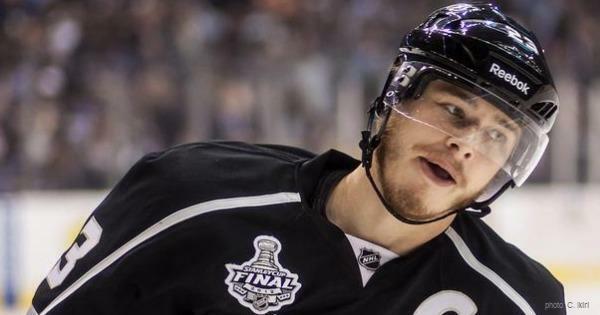 Before this new deal in Switzerland had been finalized, Brown was scheduled to join fellow Kings teammates like Jeff Carter, Matt Greene and Jarret Stoll for an NHLPA Charity Game in El Segundo, CA next Friday. Now, they’ll most likely have to proceed without him. Brown will turn 28 years old this Sunday, the day after the Kings were scheduled to play their 10th game of the 2012-13 season. For now though, without a collective bargaining agreement in place between the NHL and NHLPA, all the players remain locked out. Today’s news marks the fourth member of the Kings Stanley Cup team agreeing to a deal with a club in Europe – Anze Kopitar is with Mora in Sweden, Alec Martinez joined TPS Turku in Finland and goalie Jonathan Bernier is starting for Heilbronner Falken in Germany. Interviews with all those players – plus Trevor Lewis revealing where he’s likely to sign real soon (and it’s not in Europe) – can be found at the links down below. UPDATE – We now have an exclusive interivew with Brown posted here. Bummer he won’t be at the charity game! I am so upset by this lockout. It seems unnecessary given the state-of-the-game. Were sensible heads to prevail, the LA Kings title defense would be underway. Last time, conceptually, I sided with the owners. This time I don’t. By everyone’s definition, the owners ‘won’ the 04-05 lockout in a big way and the industry grew beyond all expectations (from $1.7B to $3.3B). Yet now, the owners are crying that it isn’t enough; I think the owners need to do a better job of managing the income that has come from that growth. The players seem to recognize the need to level the benefits -as they should- from 57%/43% to 50%/50%. Owners: Get a clue and get on board! – This tournament you mentioned is of massive importance for world rankings, it’s used to seed countries for the 2014 Winter Olympics in Sochi. Canada entered this year’s WHC ranked 5th.